Calibrate gauges in the field or in a lab! This portable gauge and transmitter calibration system is 7 to 10 times faster than a deadweight tester. It allows you to do a 10 point up and down calibration in less than 3 minutes including printing out a calibration certificate. 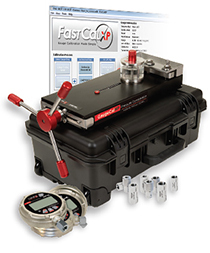 The system includes the GaugeCalHP pressure comparator, FastCalXP software, three XP2i digital pressure gauges, CPF high pressure fittings, and various accessories to make calibrating gauges quick and simple. GaugeCalHP GaugeCalHP (included) A self-contained, precision hydraulic pressure comparator intended for the calibration of pressure gauges and transmitters rated up to 15 000 psi / 1000 bar. It is faster to use than a deadweight tester and most automated pressure controllers, but it costs much less than either. It is ideal for calibrating low cost gauges that are often overlooked for ISO9000 compliance.